It’s Tech-Tip Tuesday. Here’s your tech tip for the week. WordPress won’t let you just change your username. Create a new user with the role of administrator. Immediately change old “admin” user to a “No Role for This Site” role instead of an administrator role. Bam! You have changed your username in WordPress. Step 1 – Create a new user with the role of administrator. **Very Important Note 1** – Make sure to have this new username and password written down somewhere so you can get back into your site once you delete the old user. **Very Important Note 2** – WordPress won’t let you use the same email twice, so if you want to use the same email address, we have to do one more step. Change the email address of the old user to something else. If you don’t have a spare email address, you can always make a free one in gmail. You are only going to need it while you are doing this process, because we are going to delete your old user when we are done. So then you can go back and delete the temporary email address, if needed. Step 3 – Now, to change your old user role. Click on “All Users” on the left menu, again. You will go back to your listing of all of the users and what their roles are for you blog. Click on your old user name to get taken to the “Edit User” page. About ¼ of the way down the page you will see “Role” on the left and a dropdown box to the right of it. 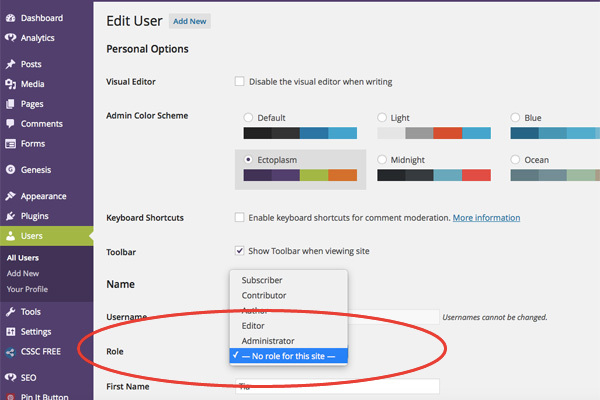 Click on the dropdown box to change the role from “administrator” to “No Role for This Site.” Also, to make the next step easier, change the “Display Name” to something different from what your new display name is. Scroll all of the way down the page and click the “Update User” button. (4) Click on the “Author” dropdown box and change it to your new user. That will change the author all of your posts to the new user. (5) Click the “Update” button over to the right. (If you have many posts, you will have to do this process for each page of posts. Scroll to the bottom. Click to go to the next posts on the bottom right. Then do the above process for each page of posts.) And done again! Step 5 – Go back to your “All Users” page under “Users.” Double check that the old user has 0 post assigned to it. Look all the way over to the right. If it is 0, then just delete the old user. If it isn’t, go back to your posts and make sure you scrolled down to go to the next page of posts and redo step 4. Step 6 – Bam! You have changed your username in WordPress. There you go! You have now changed your username in WordPress to a crazy name. Good for you! One more step in making your blog a little safer. NextGoals in Life! Perseverance! Never Give Up!